We urge all of our patients at Gustafson Morningstar Dentistry in Royal Oak MI to brush and floss their teeth at least twice a day. This very good habit is the single most important thing you can do to maintain your dental health. What kind of toothpaste should you use? There is no one-size-fits-all product on the market. One patient might be interested in whitening toothpaste, and another may need something for sensitive teeth. There’s an almost bewildering selection of toothpastes in the oral care section of any grocery store, from those aimed at children to so-called natural toothpastes. You want to make the best choice for your teeth, but it isn’t always easy to make up your mind. Different types of toothpastes have specific active ingredients that make them work. Fluoride is by far the most important thing to look for. But there are many other ingredients; what follows is a rundown of the more common ones. Detergents. Sodium lauryl sulfate is nearly ubiquitous, not only in toothpaste, but in other personal care products like shampoo. (Sometimes it’s called Sodium laureth sulfate or sodium lauryl ether sulfate. It’s the stuff that makes products foamy. Some people are sensitive to it, and some consumer advocacy groups say it can be hazardous. There are toothpastes that don’t have it. Whiteners. The most common toothpaste whitener is hydrogen peroxide, but there are others, like polyphosphates. While they do a modest job whitening teeth, many experts agree that the whitening agents aren’t strong enough, or in contact with the teeth long enough, to do a really good job. To get really white teeth, try professional whitening from a dentist. Desensitizers. Some people’s teeth are more sensitive to hot and cold foods than others. And some are more tactile-sensitive. Used on a regular basis, desensitizing toothpastes can be very effective, but it’s a good idea to get a dentist’s recommendation first. Plaque fighters. A toothpaste ingredient called triclosan is believed to fight plaque and gum inflammation. 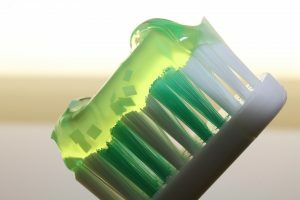 While it seemed promising at first more recent studies indicate triclosan may contribute to antibiotic resistance, and disrupt hormones and the immune system. We suggest you ask us for our recommendations, and what might be best for your particular set of teeth. Always read the label, and make sure the toothpaste you’re considering has the American Dental Association label. If you see it, it means the ADA considers it safe and effective. Whatever you choose, brush and floss twice each day! Gustafson Morningstar Dentistry in Royal Oak MI offers general and cosmetic dentistry. Schedule your next cleaning and checkup with us today.